"Crinoid stem beads were amongst the more common animals found in the sea floor communities of the Paleozoic era about 543 to 248 million years ago" Description taken from Bead data base with thanks. 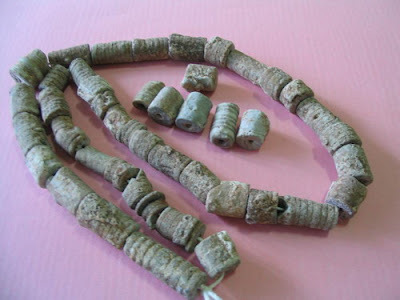 I suppose a layman like me would call them fossil beads from the remains of sea animals millions of years ago. My strand came from Cambodia and was a gift from Hans. Grey in color and barrel shaped they have a natural hole in the middle for stringing and the outer surface has natural ribbed decorations. They are rather sandy with mineral encrustations, and after 2 years, I am still mulling over how best to use them in my works. attention? I mean "Crinoid Stem Beads from the Paleozoic Era" is a little plain.